[186 Pages Report] The Artificial Intelligence as a service market is expected to grow at a significant rate over the next 5 years, due to the need to reduce infrastructure costs and analyze large volumes of data to formulate various growth strategies. The growing demand for AI-powered services in the form of Application Programming Interface (API) and Software Development Kit (SDK) and increasing number of innovative startups are some of the major factors that are expected to drive the AI as a service market. 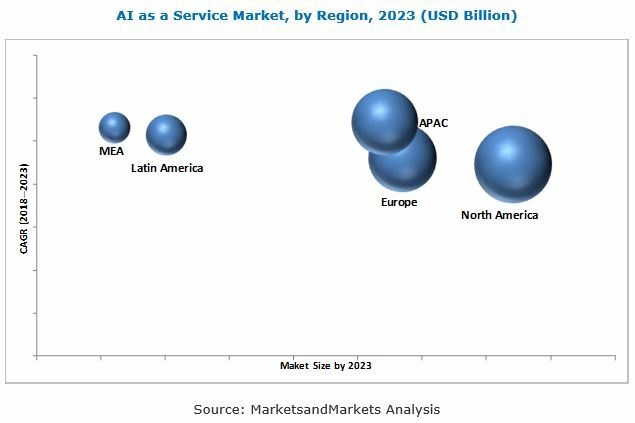 The AI as a service market size was valued at USD 1.13 Billion in 2017 and is expected to be USD 10.88 Billion by 2023, at a Compound Annual Growth Rate (CAGR) of 48.2% during the forecast period. The base year considered for this study is 2017, and the forecast period is between 2018 and 2023. The objective of the study is to define, describe, and forecast the global AI as a service market on the basis of service types (software tools and services), technologies (machine learning [ML] and deep learning, and natural language processing [NLP]), organization size (large enterprises and Small and Medium-sized Enterprises [SMEs]), verticals (manufacturing, healthcare and life sciences, Banking, Financial Services, and Insurance [BFSI], retail, government and defense, energy, telecommunication), and others (education, agriculture, transportation and media and entertainment), and regions. The report also aims at providing detailed information about the major factors, such as drivers, restraints, opportunities, and challenges, influencing the growth of the Artificial Intelligence as a service market. Major vendors in the global AI as a service market include International Business Machines Corporation (IBM, US), SAP SE (Germany), Google (US), Amazon Web Service, Inc (AWS, US), Salesforce (US), Intel (US), Baidu, Inc (China), Fair Isaac Corporation (FICO, US), SAS Institute (US), and BigML (US). The global Artificial Intelligence as a service market is expected to grow from USD 1.52 Billion in 2018 to USD 10.88 Billion by 2023, at a Compound Annual Growth Rate (CAGR) of 48.2% during the forecast period. The major factors that are expected to drive the AI as a service market are the growing demand for AI-powered services in the form of Application Programming Interface (API) and Software Development Kit (SDK) and growing number of innovative startups. Among services, the software tools services segment is expected to hold the larger market size during the forecast period. Software tools play an important role in finding hidden patterns in data and data sets to predict outcomes from the large volume of data. Various verticals such as retail, healthcare and life sciences, and Banking, Financial Services, and Insurance (BFSI) are integrating these tools with their existing business applications to analyze large volumes of data and generate data patterns. Moreover, software tools assist in formulating various business strategies and making business-critical decisions. Among technologies, the machine learning and deep learning technology segment is expected to hold the larger market size, whereas the natural language processing technology is expected to grow at a higher CAGR during the forecast period. The natural language processing technology is capable of understanding user behaviors, which is why it helps in delivering enhanced customer experience. The large enterprises segment is expected to hold the larger market size, whereas Small and Medium-sized Enterprises (SMEs) are expected to grow at a higher CAGR during the forecast period. AI services offer these organizations AI-powered capabilities, with fewer investments in infrastructure and maintenance. For verticals, the BFSI vertical is expected to be the highest contributor to the market size of the AI as a service market. Whereas the healthcare and life sciences vertical is expected to grow at the highest CAGR during the forecast period. Both verticals are adopting AI as a service to analyze large volumes of data generated from various business processes. AI as a service also help these verticals formulate various growth strategies. The other verticals such as retail, telecommunication, government and defense, manufacturing, energy, and others (Agriculture, Media and Entertainment, and Transportation) are expected to contribute significantly to the growth of the AI as a Service market, due to the increasing need for real-time data, reducing infrastructure costs, accelerating time to market, and improving business process time. 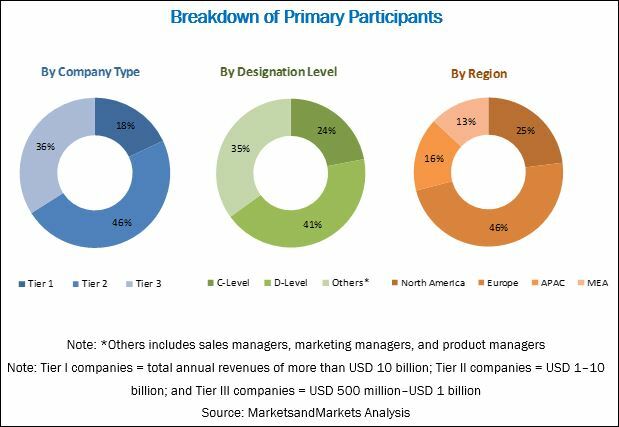 The global AI as a service market has been segmented on the basis of major geographic regions into North America, Europe, Asia Pacific (APAC), Middle East and Africa (MEA), and Latin America. North America is expected to be the largest revenue-generating region, due to technological advancements, coupled with the increasing need for intelligent business processes and the rising adoption of digital technologies. Moreover, AI solution providers are focusing on innovation and the development of AI technologies, which can be offered as a service. APAC is expected to be the fastest-growing region in the Artificial Intelligence as a service market. The growing awareness of AI as a service among various verticals and generation of the massive amount of data, due to the increasing use of digital technologies are expected to make APAC a high potential market for growth. AI as a service is used by various verticals to analyze large volumes of data for streamlining their business processes. However, access to data becomes critical, as there are various rules and regulations imposed by government authorities across different regions. Hence, sensitivity involved in accessing data may pose a challenge for the growth of the AI as a service market. However, the increasing need of organizations to sustain in a competitive world is creating the demand for AI as a service, which in turn, is expected to drive the Artificial Intelligence as a service market growth. Major vendors in the global AI as a service market include International Business Machines Corporation (IBM, US), SAP SE (Germany), Google (US), Amazon Web Service, Inc. (AWS, US), Salesforce (US), Intel (US), Baidu, Inc. (China), Fair Isaac Corporation (FICO, US), SAS Institute (US), and BigML (US).